Cyanotech saw that there was a growing demand from consumers in the area of nutritional supplements so in order to reach the general public, Nutrex Hawaii – the bottled, packaged division of Cyanotech, was founded in 1990. Nutrex Hawaii came to life in Kailua-Kona, Hawaii and is the brain child of Cyanotech’s founder, Dr. Gerald Cysewski. From a small company that started off with a sales team of two, to growing into a company with the world’s most recognized brands of spirulina and astaxanthin, Nutrex Hawaii products are sold in over 66 countries including mass market retailers in the US. Nutrex Hawaii produces two finished goods products, Hawaiian Spirulina® and BioAstin® Hawaiian Astaxanthin®. BioAstin Hawaiian Astaxanthin is the only mass marketed astaxanthin brand grown in an open culture system under the hot, Hawaiian sun from Haematococcus pluvialis microalgae. The algae produces the antioxidant astaxanthin when exposed to the elements. When the algae is ready for harvest, it is sent to our in-house extraction plant where it is skillfully extracted using high pressure, supercritical CO2. 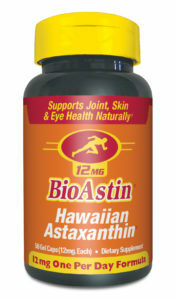 BioAstin Hawaiian Astaxanthin has a wide range of health benefits including joint & tendon health, skin health, cardiovascular, eye, & cellular health, as well as recovery from exercise. BioAstin is available in a 4mg or 12mg gelcap. Also available in our MD Formulas line. BioAstin Hawaiian Astaxanthin contains Non-GMO Project Verified astaxanthin and is certified natural by the Natural Algae Association (NAXA) and gluten-free. A superior strain of arthrospira platensis, evolved from many years of continuous cultivation in the pristine and ideal growing conditions of Kona, Hawaii. Hawaiian Spirulina is a highly absorbable source of protein and essential amino acids, iron, beta carotene, minerals, and numerous other health vitamins including B-Vitamins, GLA, and phycocyanin, a pigment protein antioxidant complex found only in blue-green microalgae. Available in powder or tablets. Also available in our Green Complete Superfood Powder and Plant Protein Shake. 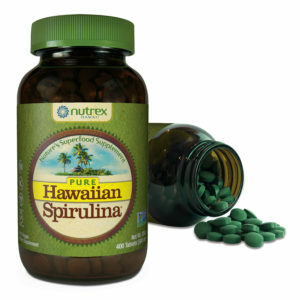 All Hawaiian Spirulina products are Non-GMO Project Verified, gluten-free, Kosher, and Halal. BioAstin Hawaiian Astaxanthin and Hawaiian Spirulina are the nation’s #1 brands in their respective categories and continue to see growth in consumer demand and recognition. Besides unsurpassed quality, Nutrex Hawaii products are unique compared to other supplement brands because we grow our own products on our farm vs. buying ingredients from other companies. The location of our farm in Hawaii and the meticulous attention to detail in each processing step creates a superior supplement that is truly, “Farm to Bottle.” This approach to manufacturing is a differentiating characteristic that is virtually unheard of in the supplement industry and is one difference that allows for our products to stand out in the marketplace.